As a distinctive hot sauce incorporating the smooth bite of aged bourbon, Jim Beam hot sauce adds a flavorful kick to meats, vegetable dishes and dips. Some really tasty heat is generated in this sauce, which also features bits of red and green bell peppers, along with the extra fiery kick of spicy chili peppers. Known as the most popular bourbon all over the world, Jim Beam bourbon whiskey and its distilleries were established around 1800 by the Beam family, who still own and operate the company. Prohibition temporarily ceased production of the whiskey but it was later restarted in 1933 by Colonel James B. Beam. According to business press releases, Jim Beam bourbon is still produced in pretty much the same way it was made two centuries ago. In addition to Jim Beam hot sauce, the company also makes Jim Beam BBQ beef jerky and Jim Beam jalapeño sunflower seeds. Because you bake these chicken wings instead of fry them, the fat content is low and healthy enough to allow you to indulge without feeling guilty. 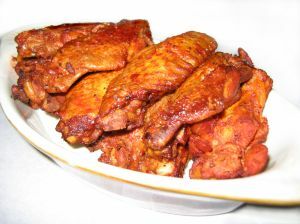 Cover the wings with a mixture of the sauce, butter and paprika and bake for approximately 45 minutes at 350-375 degrees. One option is to serve the wings with bleu cheese dressing if desired, since this may take a little of the fiery tang out of each bite, but remember not to skimp on the napkins! Put all these ingredients into a large saucepan and bring them to a boil. Then reduce heat until it is simmering, leaving it uncovered so it can thicken. When the sauce is thick enough to start spattering out of the pot, you'll know it's done and ready to emblazon meats and vegetable dishes with its own brand of fiery flavor. If a friend mentions how much they love your wings or baked beans made with Jim Beam hot sauce, you can also give them a Jim Beam gift box which contains Jim Beam BBQ sauce, hot sauce, wing sauce and a handy recipe booklet.